Following this tradition, the new NexXxos radiators are the first to truly deserve the “Full copper” attribute. All main parts, not only the fins and channels, but the chambers are also made from copper. This brings an improvement in performance where other radiators are left without a chance. In structure, the Alphacool NexXxoS X-Flow Radiators differentiate materially from the standard radiators. The X.Flow Radiators are designet for high flow rates. The bevelled copper chambers on both sides have an identical structure. This Water is jetting at the same time through all avialable channels to the other chamber to whitch it then leaves the radiator. Versatile and easy mounting is one of the main points, on which the research and development department at Alphacool focused. The chamber offers three possibilities for fitting installation on both inlet and outlet (not on the NexXos ST30). Less angled fittings are needed, improving flow rates and offering more mounting possibilities. 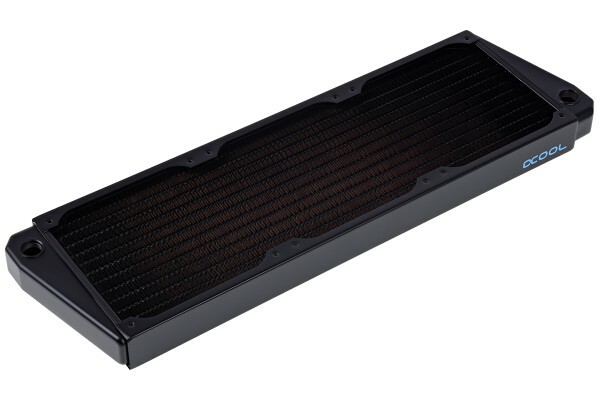 Here, too, Alphacool provides the popular sizes of the 120mm series. Different thicknesses, 30mm, 45mm and 60 mm underscore the broad spectrum that cover these radiators. Even mounting and installation of fans and radiator grills is easy and versatile with these radiators: The M3 threads are standard in the radiator sector and available in all lengths at an affordable price. Here you can find all measurements for this radiator: http://www.alphacool.com/download/NexXxoS_XT45_360_%20XFlow.pdf So you can check if that radiator will fit or not. ich würde mir dieses format sehr für 140mm lüfter wünschen, habe es aber leider nicht gefunden. ist das in planung? Wird der 420er 16 Fins per Inch haben? Wann wird er rauskommen, ich bräuchte ihn Ende Juni. Sind die FPI wirklich 16? Ich habe aus verschiedenen Quellen jetzt verschiedene FPI für diesen Radiator herausgefunden. Möchte diesen mit Silent Wings 2 betreiben, daher sind wenige FPI wichtig. Offensichtlich ein copy & paste fehler, es müssen 10 fins per inch sein. Wird korrigiert. Auf der Alphacool Seite steht auch 16 fpi, welche Angabe stimmt denn jetzt? Ich suche 360/420er Radiatoren mit 30-45mm mit 16fpi oder mehr.